With this Flexson ceiling mount your Sonos Play:1 can be up and out of the way, yet still fill the room with music. Ideal for businesses and restaurants, this mount is also great for home use. The sturdy steel mount features a bracket that can both swivel and tilt, so you can position your Play:1 for optimal sound. And you have the option of mounting your speaker upside down, which gives you easy access to its control buttons. width to speaker edge: 5-1/8"
Great design and good looking speaker mount. I would rate it five stars if the price was much lower. I'm using mine outside, although it is not directly in "the weather." It looks like it should be fine in indirect weather. 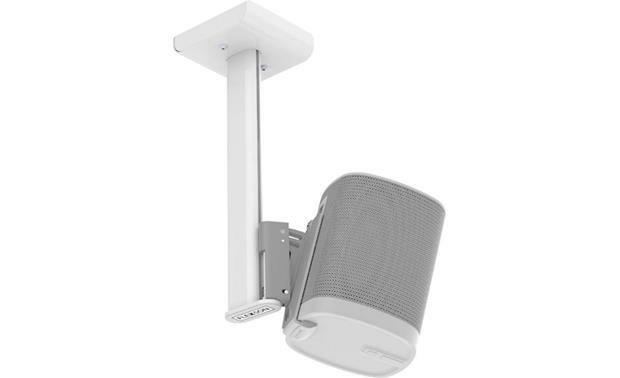 Compatibility: The Flexson FLXP1CM2011 bracket allows you to hang a pair of Sonos Play:1 wireless active speakers (sold separately) from the ceiling using a single ceiling mount bracket. The Flexson ceiling mount bracket is precision engineered to perfectly match the size and style of your Sonos Play:1 speakers. Note: The Flexson FLXP1CM2011 bracket is not compatible with the Sonos One. Tilt & Swivel Adjustment: The Flexson ceiling mount has a unique tilting mechanism, as well as the ability to swivel left or right, so you can perfectly angle your sound. You'll be able to tilt your Sonos Play:1 speakers 15° down and swivel it 80° (40° right & 40° left). 11.8125" Extension: The Flexson FLXP1CM2011 bracket holds your Play:1 speakers 11.8125" below ceiling. The ceiling bracket can also be attached to a standard 50mm extension column with adapter (870CMPW, sold separately). Inverted Orientation. The Flexson ceiling bracket even allows you to invert the speaker bracket, so your Play:1 speakers are mounted upside down in order to access the controls better. Wire Management: The Flexson ceiling bracket features a wire channel to conceal the Play:1 speakers' power cables running from the ceiling. Installation: The ceiling-mount bracket should be screwed into a wood stud using four wood screws (not included). The included speaker brackets attach to your Sonos Play:1 speakers using the supplied 1/4"-20 screws. Once the ceiling-bracket is mounted securely to the ceiling and the speaker brackets are secured to the Play:1 speakers, the speaker brackets get seated on the ceiling-mount bracket using its click-mount system. Applications: The Flexson ceiling mount bracket for the Sonos Play:1 is ideal for homes, offices, bars, restaurants, and shops.